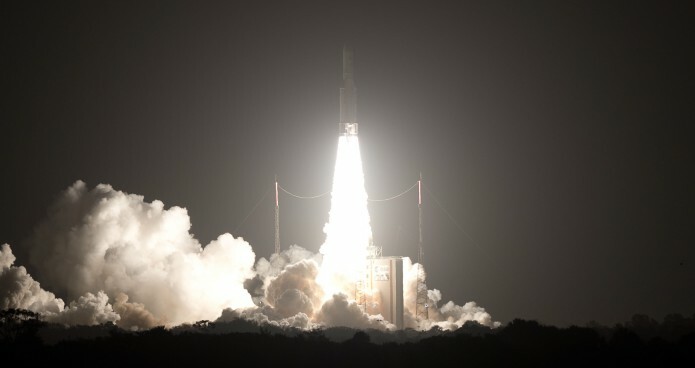 The numbers continue to add up for Arianespace following today’s early morning Ariane 5 mission that orbited the EUTELSAT 65 West A relay satellite – extending to 71 the heavy-lift vehicle’s streak of consecutive successes, while achieving other numerical milestones for the company as well. Lifting off exactly on time from the ELA-3 launch zone at Europe’s Spaceport in French Guiana, Ariane 5 deployed its passenger at the conclusion of a 27-minute flight sequence. For today’s success, EUTELSAT 65 West A had the distinction of being a single telecommunications satellite on a dedicated Ariane 5 flight – compared to the typical dual-payload configuration for this launcher on missions to geostationary transfer orbit. Making the mission all the more special was EUTELSAT 65 West A’s status as the milestone 525th satellite overall to be launched by Arianespace, as well as its being the 31st orbited by the company on behalf of Paris-based Eutelsat Communications. Both were points of emphasis during post-launch comments by Arianespace Chairman and CEO Stéphane Israël, who spoke via satellite from National Harbor, Maryland, where he is participating in the on-going Satellite 2016 conference and exhibition. EUTELSAT 65 West A – which had a liftoff mass of 6,564 kg. – combines broad coverage in C- and Ku-bands for video distribution, cellular backhaul and direct-to-home broadcasting with a high-throughput payload for broadband access in the Ka-band. The spacecraft will operate from an orbital position of 65 deg. West, where it will serve expanding markets in Brazil and across Latin America. During his post-launch comments, Arianespace’s Israël also put a spotlight on payload prime contractor SSL of Palo Alto, California. EUTELSAT 65 West A was the 53rd satellite built by this company to be launched on an Arianespace mission, with 12 more to come based on the current launch services order book. Also receiving credit from Arianespace following the success were Ariane 5/Ariane 6 industrial lead contractor Airbus Safran Launchers; the European Space Agency and its 12 member states that provide full support for the Ariane launcher program; the CNES French space agency, with its Spaceport resources; along with the industrial base and Arianespace’s own operational teams. – Perigee: 249.8 km. for a target of 250.0 km. – Apogee: 35,909 km. for a target of 35,896 km. – Inclination: 0.48 deg. for a target of 0.50 deg. Designated VA229, Arianespace’s mission with EUTELSAT 65 West A was the second performed this year as part of the company’s busy launch manifest for 2016 – following the year-opening Ariane 5 success that orbited Intelsat 29e on January 27. Arianespace is targeting as many as 12 missions during the year using its full launcher family, which includes the heavy-lift Ariane 5, medium-lift Soyuz and lightweight Vega vehicles. In performing its first two missions by early March, Arianespace also is well-positioned to achieve its goal of eight total launches in 2016 with Ariane 5. The company’s next mission is scheduled for April 22, when Soyuz will deliver another spacecraft for the European Commission’s Copernicus program – Sentinel-1B – accompanied by auxiliary payloads.